Many times over the years, I have taken the journey on Highway 17 and then turned to take the bridge over to Johns Island. I have had celebrated at the annual Sea Island Cultural Arts Festival on the island and been invited into a home built by Sears of “Sears & Roebuck.” I have also poured libations at the base of the majestic Angel Oak and educated students at the schools on the island so that they would know the truth about Gullah/Geechee culture. We wan de chillun fa kno who e be. The last time that I entered a school house on the island, it was for a meeting to see maps of potential highway designs for Johns Island which were plans to expand I-526 onto the island and cause further displacement. Yet, these designs were being spoken of as a “greenway” and “green belt.” As I walked into and out of the building that night, I looked into the eyes of Esau Jenkins who was on a painting on the wall in the hallway. I could feel him watching what decision I would make and I could feel him pushing me on to continue to stand up for the people and even for this island which was bridges and waterways away from that which I called home. Whenever I would return home to my island, my family members would want to know what was happening on Johns Island. So, they would begin to travel with me to the celebrations. On September 8, 2013, we made the journey over the bridge once again. This time it was to honor this man whose eyes I looked into before. We made our way to the grounds that he had helped to hallow out and create a space of gathering and forward progress for the Gullah/Geechees of Johns Island where a historic marker would now be erected. This honor which was long over due was presented at the front of this property while historic ruins of the building that the community had fought to build stood in the back. This was the site of the Progressive Club. 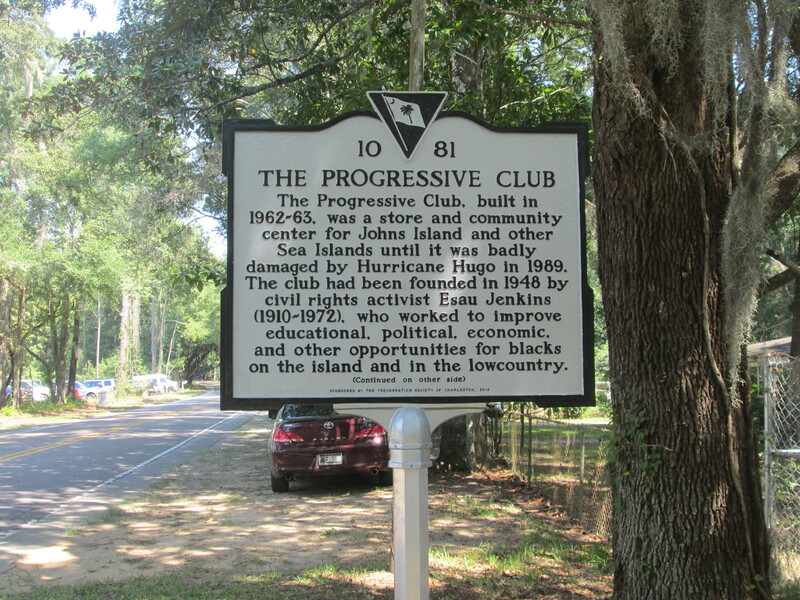 The Progressive Club was established in 1948 by Esau Jenkins to help the people of John’s Island and the surrounding areas. Bill Saunders worked side by side with Mr. Jenkins to raise the funds and to bring members together. 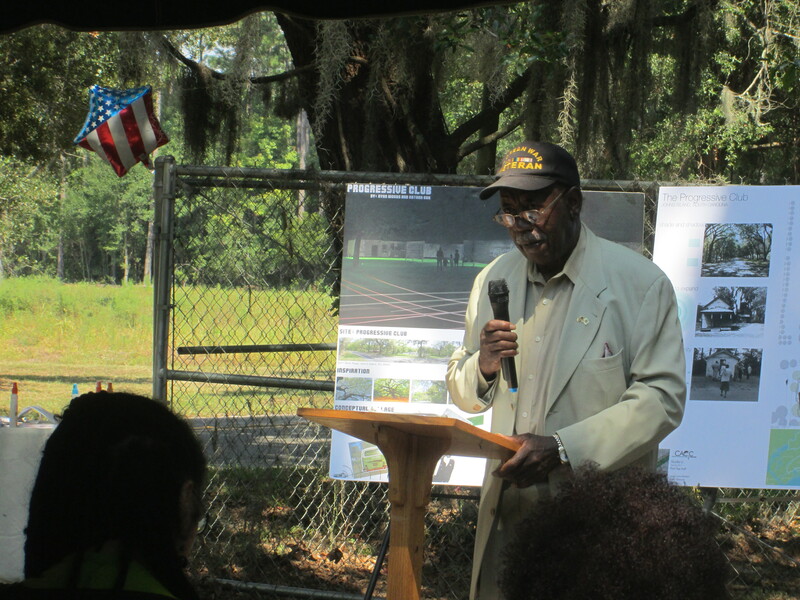 Bill Saunders speaks on the history of the Progressive Club at the historic marker dedication on September 8, 2013 on Johns Island, SC in the Gullah/Geechee Nation. 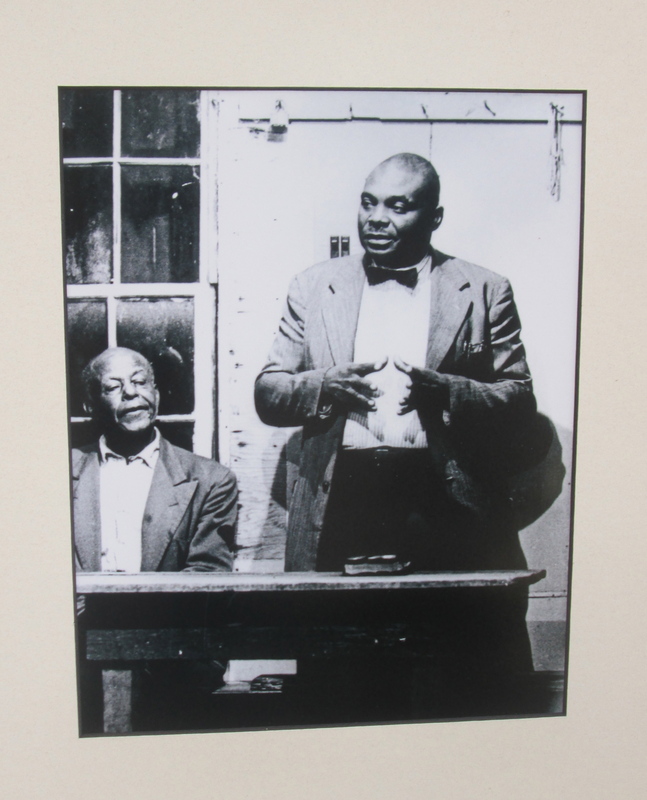 Mr. Deas and Esau Jenkins at the Progressive Club on Johns Island, SC in the Gullah/Geechee Nation. 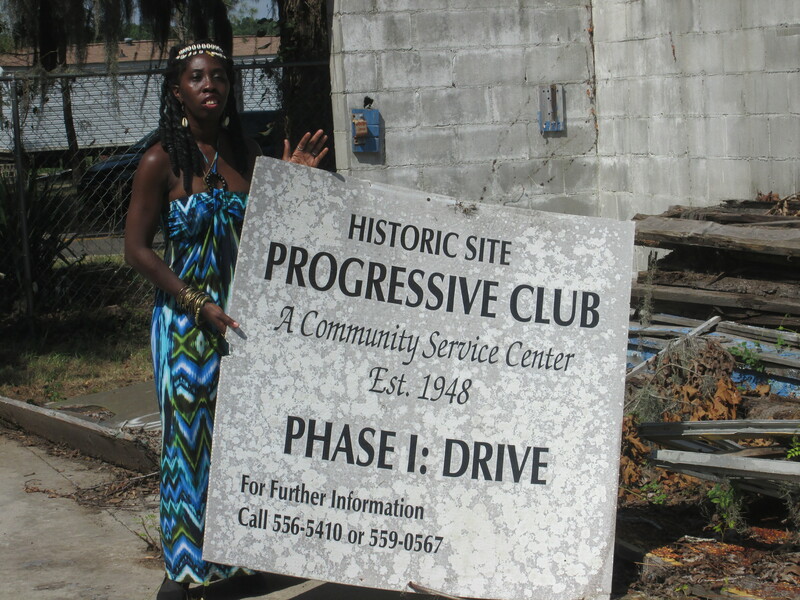 The Progressive Club provided community services and voter education. The building that has come down due to storms over the years once included a grocery store, a recreation center, child care facilities and classroom space for citizenship and voting classes. 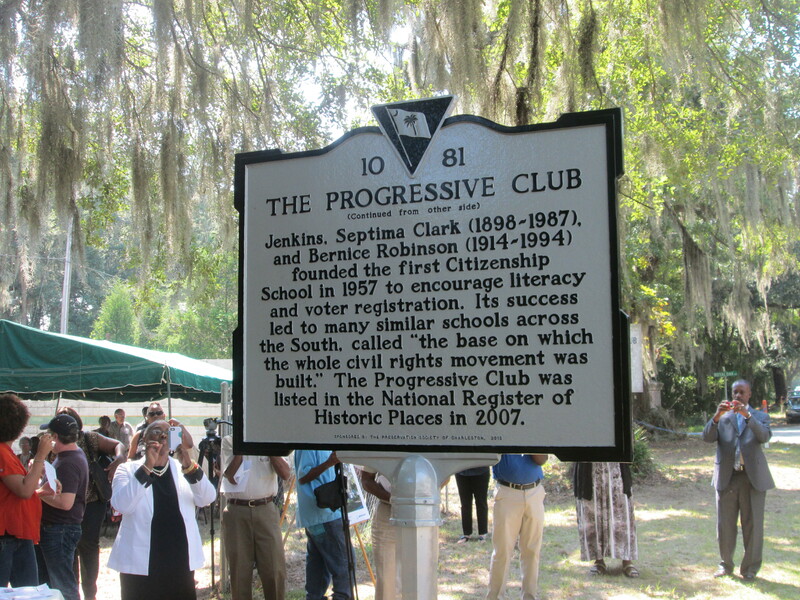 The Citizenship School where Septima P. Clark taught started at the Progressive Club in 1957. This became the model for similar schools throughout the Southeast and those educated in these schools were deeply involved in the Civil Rights Movement. It is no doubt this energy of the stand for rights that is within the very soil of Johns Island which continues to fuel the success in the movements to protect both the land and citizens rights today. The “Save the Angel Oak” movement (www.savetheangeloak.org) went from the vision of a couple of women to a regional and national effort. The destructionment that was being planned for this site has been stopped. Now there is an effort to raise $1.2 million in order to expand the current park area and create a wonderful outdoor engagement space that will be open to all. Funds are being donated daily at http://www.lolt.org/community-initiatives/angel-oak-preserve.html. While truly fighting for “greenways” such as the area around the Angel Oak, Nix 526 has to fight against the propaganda that has been presented to attempt to minimize the negative impacts that the extension of I-526 onto Johns and James Islands will have on the Gullah/Geechee Nation’s citizens and on the environment of these Sea Islands. The addition of more highways continues to eliminate the God given greenways that we have along our tree lined roads such as those throughout Johns Island and with our marsh that is the home to so many of our sea creatures that our people have lived in balance with and nourished our families with over the generations. Although Nix 526 still stands their ground and continues to make progress in regard to receiving just compensation for the financial loss of land and property values for those living within 1,000 feet of the I-526/Mark Clark Expressway expansion onto the Sea Island, there is no value which can be calculated to compensate for the loss of history, heritage, culture, family ties, and traditions of the Gullah/Geechees that will be adversely impacted by yet another highway expansion on Johns or James Islands. Some people call new roads and expanding roads, “progress,” but this is not in any way in line with what the Progressive Club members that shouted and sang and sat in had in mind. They sought to insure a future wherein their families could educationally and economically benefit while on the land on Johns Island. They did not anticipate having to remove themselves from the island soil in order to simply live and survive. 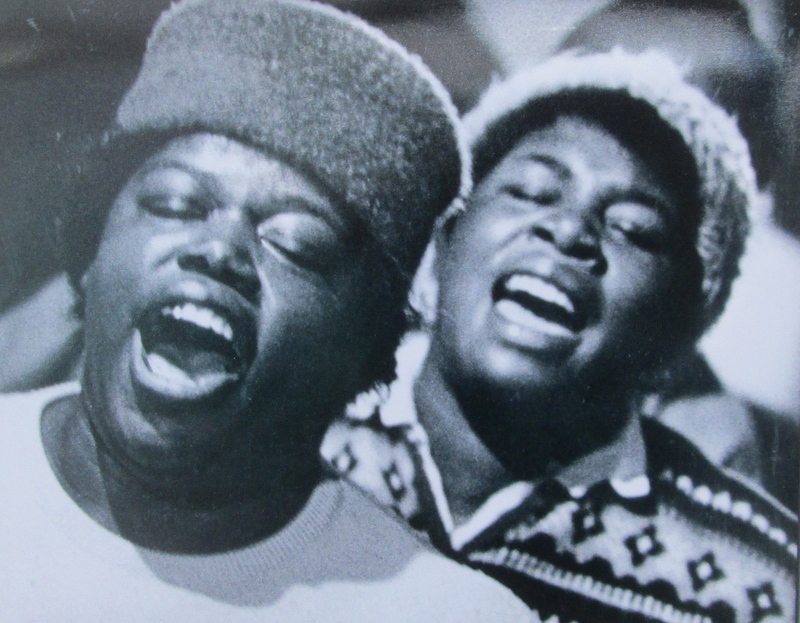 So, may the angels that have long since sat on the limbs of the oak trees on Johns Islands continue to fly around and protect the island from destructionment and may the waves hit the sea shore in a syncopated polyrhythm like so many Gullah/Geechees shoutin een de Moving Star Hall. May these waves bring healing and protect the Gullah/Geechee families and unite and keep them together on the island making progress forever! Photos from “Ain’t You Got a Right to the Tree of Life” book and “Tree of Life” exhibit which can be seen at the Johns Island Schoolhouse Museum (http://jicsc.org/index.php/tree-of-life/). “Moving Star Hall Singers” image by Photo by Robert Yellin Courtesy of the College of Charleston Avery Research Center and by Queen Quet, Chieftess of the Gullah/Geechee Nation (www.QueenQuet.com) Courtesy of the Gullah/Geechee Alkebulan Archive (www.gullahgeechee.net).